An important new analysis of IPA case studies, by Les Binet and Peter Field. It is widely accepted that the case studies submitted to the IPA Effectiveness Awards are the most rigorous available. What is less well known is that the competition has enabled the IPA to build a separate database of confidential data about brands, their market situations, campaigns and results. This objective, comparable data is immensely valuable because it observes the conditions of proven, effective campaigns. This publication contains the first full analysis of this data. 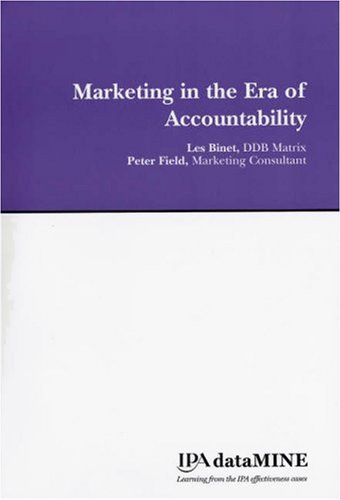 Based on a sample of 880 campaigns, Marketing in the Era of Accountability not only reveals factors that make marketing profitable, but also exposes practices and myths that lead to waste and inefficiency. The findings in this report are so powerful because the analysis is entirely evidence-based – there are no unsubstantiated opinions or theories. Building on this empirical foundation, the report provides dozens of detailed recommendations and best practices covering every stage of campaign development and evaluation. There are of course no 'off-the-shelf' solutions to a successful marketing strategy. But this report reveals proven success factors that can be adopted in virtually any product category. Published June 2007 by Warc in association with the Institute of Practitioners in Advertising. The authors have hit all the right buttons with this book. They explain how the phrase 'ROI' is abused by most people who utter it and how, precisely, something can be done about it. This report can make a strong claim to be the most important contribution to understanding advertising effectiveness of recent years. Since I saw a taste of the data presented at an Admap conference, I've been waiting for the full story. It's well worth the wait: this is a really compelling analysis that every marketing and ad executive should read.